Live Maine Lobster Shore Dinner for Two! Home > Mother's Day Dinners! > Maine Lobster Shore Dinners! > Live Maine Lobster Shore Dinner for Two! Our Live Maine Lobster "Shore Dinner" For Two Is A True New England Dinner! 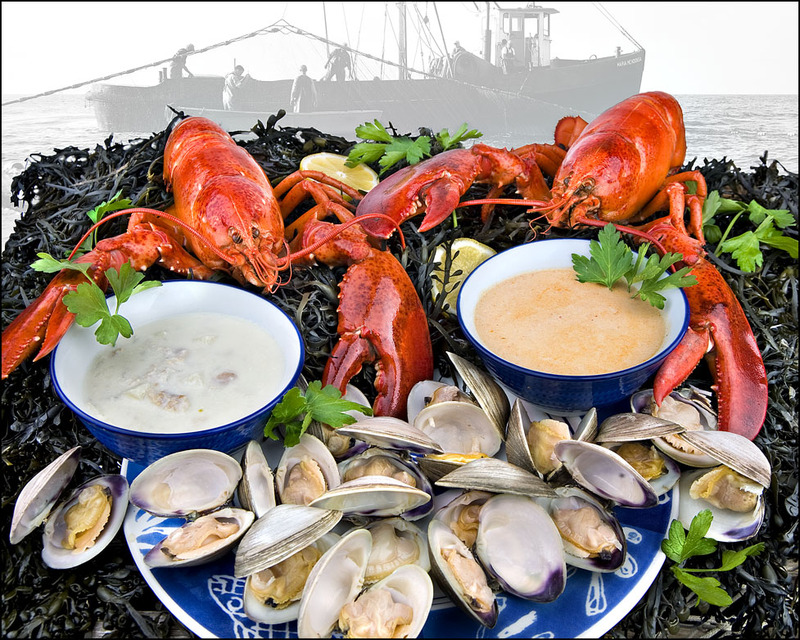 Complete with Two 1 1/4 pound Live Maine Lobsters, Award Winning Clam Chowder, Superb Lobster Bisque & Fresh Littleneck Clams! This Is New England Dining At Its Finest! Land O' Lakes Butter • Lobsters & Chowder! • Maine Shore Dinners! LobsterGuy's Shore Dinner Comes Complete with Two 1 1/4 pound Live Maine Lobsters, Award Winning Clam Chowder, Superb Lobster Bisque & Fresh Littleneck Clams! A Great Gift Idea for Holidays, Anniversaries, Birthdays, or just a Great Thank You!! Order Our Famous Lobster Shore Dinner By 10am EST, And Enjoy It For Dinner Tomorrow! Our Shore Dinners Also Make A Great Gift Idea For Your Favorite Seafood Lover! How Easy Is That! You can easily place your order online or by calling us toll free at 866-788-0004. We ship Monday thru Thursday for delivery on Tuesday thru Friday (NO Sunday or Monday delivery).A Great Gift Idea, for Holidays, Anniversaries, Birthdays, or just a Great Thank You! I sent this as a surprise for my Army son and my new daughter-in-law. There is no fresh seafood at his Army base or surrounding grocery stores. I came across an elementary school journal of my son�s. The topic for one journal entry was �what is your favorite food?� My son being a true NE boy of course said all seafood but especially lobster. That is when I found the LobsterGuy! When I emailed the LobsterGuy and told him the journal story they were more than happy to include a scanned copy of the original journal entry with the lobster dinner! My son was so thrilled with the dinner and the note. It was just the taste of home my Army boy needed! Surprised my husband and he loved it! The lobsters were so wonderful! My favorite were the clams! And the clam chowder was so good and full of flavor! I am not a fan of bisque but my husband loved it! Plus, the response I received when I had questions prior to ordering was so nice! Can't wait to order again! My son and his wife surprised us with this delicious dinner for Mother's Day. The lobsters were so delicious , as were the clams. Everything tasted so fresh. The lobster bisque was the best I've ever had and the clam chowder was full of tender clams. Just a wonderful feast and so yummy!